Bathroom fans are extremely common fixtures in most households, yet we rarely pay them any attention. However, if the day has finally come for you to replace yours, this buying guide is for you. 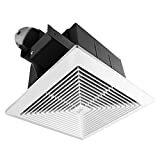 It will help you differentiate between the different types of bathroom fans, give you tips on choosing the right one for your household, and let you in on the top-rated brands according to other buyers just like you! 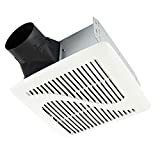 Regular Fan: Most regular bathroom fans consist of a single-function fan that is dedicated to increasing airflow in order to eliminate or reduce moisture and smells. Fan with light: Other bathroom fans serve as both a fan and a light. These can function at once or separately. 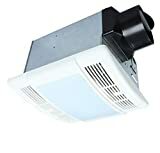 In addition, some bathroom fans feature a “night light” feature, which allows you to turn on a dim, gentle light in order to spare your eyes undue light sensitivity in the middle of the night. Fan with heater: Finally, many bathroom fans are accompanied by a heating function. 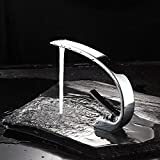 These are especially nice in areas where there are cold conditions or for people who want to avoid the shocking cold experienced when stepping out of the shower. 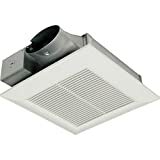 Easy Installation: As with anything that requires installation, many users were concerned that their fan would be difficult to install. However, the top-rated bathroom fans were said to be straightforward and quick to install. This was an enormous relief to reviewers, especially those with little home improvement handiwork experience. Noise: Positive reviewers noted that the noise emitted from their bathroom fans was at an acceptable level. Quiet enough to be tolerable in the background but loud enough to cover any potential bathroom noise. 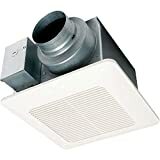 Moisture Elimination: Users who rated their bathroom fans highly were extremely impressed with the absence of excess moisture in the bathroom after taking a shower. Numerous reviews on the top-rated bathroom fans commented that there was absolutely no moisture build-up on the mirror when they got out of the shower. This is a fantastic quality as moisture build-up may cause health and hygiene problems that can be prevented simply with a bathroom fan. Moves Air Efficiently: Satisfied users wrote that their fans moved air quite efficiently. Odors and moisture were moved out of the air quickly and with minimal noise. Installation: If the idea of a complicated installation process sounds daunting to you, be sure to read reviews on the ease of installation for each fan. Some fans may just come with clearer instruction manuals than others, regardless of quality. Be sure you know what you are getting into before you choose which fan to purchase for your bathroom. Aesthetics: Each bathroom fan on the market has its own unique look. Consider the bathroom it will be installed in when purchasing your new fan. Color, size, shape, and material should all be kept in mind. Your fan will last you for years to come so be sure it is exactly what you want! Location: Another factor to take into consideration is the location of the bathroom where you want your new bathroom fan installed. Depending on this, you may prefer to have more background fan noise or you may want it to be as silent as possible. Look over what other users have to say about the noise of each fan before making your final decision. 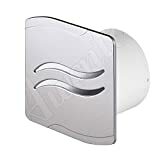 Multi-use: As we mentioned before, some bathroom fans come with multi purposes. Many come with a light, a heater, or both. 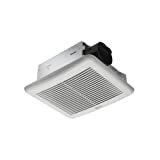 If you live in a cold climate or like a toasty room when you leave the shower, a dual fan/heater would be best for you. If you prefer dim lighting at night, perhaps opt for a bathroom fan with a nightlight feature. Broan: Broan was established in 1932 with a kitchen fan called the Motodor. 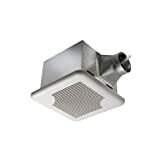 Today, it is the industry leader in residential ventilation and customized climate products. 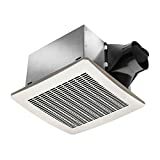 Air King: Air King has been in business for over 40 years and upholds an outstanding reputation for manufacturing quality ventilation products at a great value and for providing excellent customer service for their products. They strive to provide innovative ventilation systems to the areas that need it most. Delta: Delta was established in 1971 in Taipei, Taiwan and has sales offices and R&D centers all over the world. They are a global leader in power electronics with a commitment to environmental protection through using green, lead-free production.